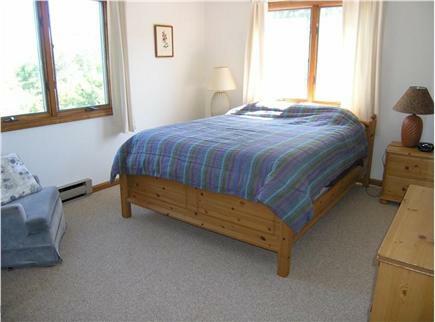 Artist/writer's home in upscale private community in Truro. Spacious upside-down home (living area on second floor) with an open layout takes maximum advantage of views out windows and sliding doors. It's a 3 minute walk to one of Truro's great, safe family beaches, Great Hollow Beach (along a paved road--no need to negotiate steep steps to the beach). Major remodeling was done in 2009. 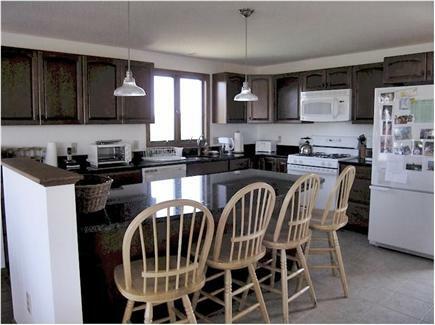 The fully equipped kitchen has granite counter tops, ceramic floor, gas range, new cabinets, microwave and refrigerator. 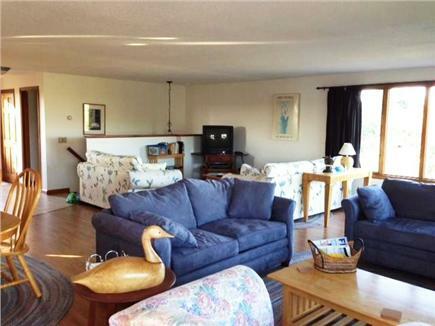 The living room has laminate wood flooring, and lots of space for relaxing. New couches, new HD TV in 2014. Large, light and airy bedrooms. Three full baths. The master bedroom suite has a sliding glass door to a first-floor deck, perfect for enjoying your coffee while you watch the sun rise. Enjoy dining al fresco or just relax with a beverage on the large wrap-around deck off the living room. The expansive living room also affords sunset and sunrise views. 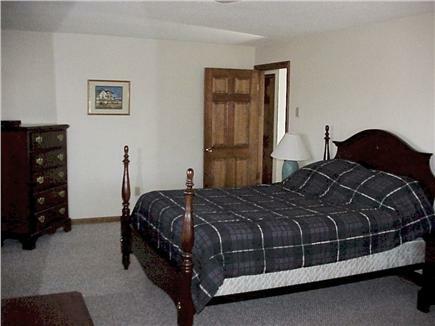 Amenities include secure wireless Internet access, HD cable TV and DVD/VCR player, gas and charcoal grills. It's an easy walk to both Great Hollow and Corn Hill beaches on Cape Cod Bay. 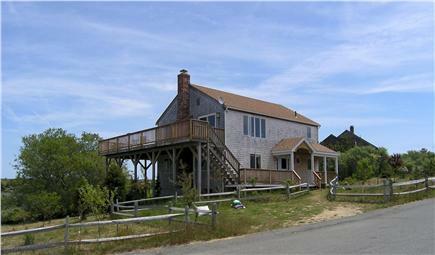 Close to National Seashore attractions and Great Island. Uncrowded and spectacular Truro town ocean beaches and cliffs. All of Truro's ocean shoreline is within the National Seashore, so you can enjoy nature to its fullest, or learn more about this ''bare and bended arm'' at the Provincelands Visitor Center. Great surf fishing for stripers and blues in the ocean or bay. Truro is the least populated town on Cape Cod. Great swimming awaits in the Bay or in the Truro fresh water ponds--they are uncrowded treasures! Tour the Truro Vineyards, climb up the Highland Light (Cape Cod Light), golf at the Highland Links Golf Course--the oldest links course on Cape Cod! Have an evening bonfire on the beach (permit required). Provincetown attractions and Wellfleet galleries are both close-by. Ride bikes on the Cape Cod Rail Trail, go on a whale watch to see humpback whales, spot seals from the beach. Walk the trails at the close-by Wellfleet Bay Wildlife sanctuary. The Stop & Shop grocery store is 10 minutes away in Provincetown. A farm stand and fresh fish market are close to the intersection of Rt 6 and Great Hollow Road. Many close-by, great restaurants, for families or fine dining. Enjoy concerts on the Truro Green. Additional pricing info: State tax (5.7%), Local tax (4.0%) and Wastewater tax (2.75%) will be added to rental fees shown, State and local taxes of 12.45% will apply. This is our second year at this beautiful home in Truro. It is perfect for family to relax and enjoy the open kitchen and family room space. House has beautiful big deck to relax and grill. Beach is short walk down the street and ocean beaches are close by. Great local restaurants nearby. Anne and Marvin are great to work with and we look forward to returning next year. We have just unpacked from a wonderful vacation. Your home provided the perfect setting for us to spend quality time with our family. The home is beautiful, comfortable and so relaxing out on your great deck. We loved the local beach and the fact that we were so close to many other beaches. We enjoyed great meals in Truro and Wellfleet, and it was great to be so close to Provincetown to cheer on our son as he completed his PMC ride. We cannot wait for next year. If your home is available the week of August 5th, please pencil us in! Thank you, Mary and John, for your kind words. We're so happy that our home suited your needs and that your vacation was good and relaxing! 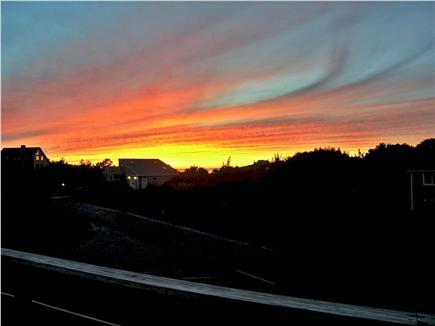 I had the luck to have a great grandfather who took to Truro, and I share his appreciation of its beauty. 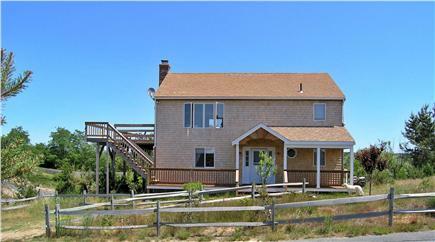 This home offers what I find best about being on the Cape - a beautiful bay beach a minute's walk from the house, easy drive to other beautiful beaches, wonderful roads to walk and the breeze steadily blowing through the many windows. 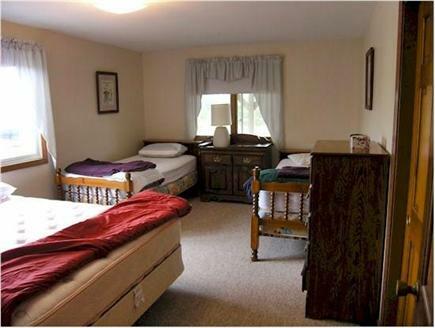 The rooms are well-sized and easy to feel at home in. Clean and comfortable, well equipped, roomy. 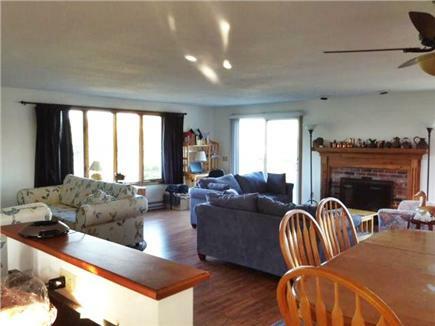 The social areas - kitchen, dining, living room open space, with attached decks on 2 sides - make it a home. Plenty of storage - so it never feels cluttered. Family and friends stopped by and fit in easily. What pleasure. The cooking areas work well. Saying that, we were lucky because the weather was good and on the cool side. My sisters were in houses that all had AC. We didn't. They said they never would have thought it important but in recent years have had very hot days where the AC was much appreciated. This house has sufficient fans, I think. The only problem is that as is typical of Cape houses that get closed up often - molds grow. Some of the downstairs furniture has drawers that smell moldy. If you are sensitive to molds, think about how you'll deal with it, if you react inside. Not a problem for some. Just good to know about ahead of time.